Many of the scale RailKing signals made by MTH are die-cast models of the signals made by Right-of-Way Industries, which is now out-of-business. We just took a look at the new Cantilever Signal Bridge. It's very sharp with a feel of quality. It's painted silver and has two individual target assemblies. There are two sets of wires from the base to hook the signals separately. This is probably meant to span two track lines but that would be a pretty tight fit to have each signal directly over each line. The color aspects of red/amber/green are provided by LEDs. If you're not familiar with how these signals operate, you need a single-pole/double-throw switch. The traditional pressure-plate contactor or modern Infrared Track Activation Device sold by MTH are examples. A train changes the signal from green to red. After the train has passed, the signal turns amber for about five seconds, then back to green. An amber aspect is something that Lionel has not yet manufactured. Lionel's new Cantilever Signal Bridge will only have red and green aspects. The detail on the MTH model is good. A screen walkout, metal ladder, wire handrails, and simulated rivets combined with the sturdy tower and gantry make a great looking piece. It's top-heavy so it must be fastened down for use. 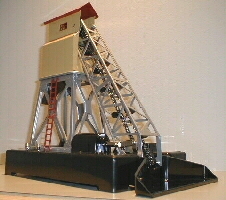 Also just released are MTH's versions of Lionel's 450 Signal Bridge, 395 Floodlight Tower, and 193 Industrial Water Tower. The floodlight tower looks sensational. The yellow perfectly matches the hue of the rarest variation of the original. The signal bridge looks like the original, with die-cast target covers and bayonet-base lamps. The recent versions Lionel has been producing have plastic light assemblies and use those plastic-base push-in bulbs. Finally, the Industrial Water Tower has a white and red checker-painted tank to warn off low-flying aircraft. The tower is painted black and the base features painted gray stone detail. Instead of "Lionel N.Y." at the top of the tank, the words "MTH RailKing" is in raised letters. One strange feature is a red flashing lamp in an amber lens at the top. Did they want red or amber blinking? All products just reviewed were made in China. This is the third reissue of the "Classic Four" Prewar/Postwar accessories after the 164 Log Loader and 313 Bascule Bridge. The Log Loader was a big disappointment. Instead of taking the original and reproducing it a lot of manpower was wasted on reengineering the piece and replacing major metal components with plastic ones. The Bascule Bridge, on the other hand, was reengineered so that it works better and looks just as good as the original. When the reissue of the 97 was announced, we were skeptical. Obviously the chain-driven buckets would be powered by a DC motor, but what about the coal chute and dumping bin? On the original they were each powered by a solenoid and plunger. On the reissues of the Log Loader and 138 Water Tower, the solenoids were replaced by DC motors to make the actions gear-driven. We're happy to report that on the 97, both the chute and dump bin are powered by solenoids, just like the original. So they operate and sound just like the original. As for the appearance, we placed this next to an original and they looked identical. At closer inspection, on one of the steel supports the circle-L logo is stamped in instead of having the red ladders on both sides of the accessory. A small black circle-L logo is a separate plastic piece fastened into the black plastic base. The base is sturdy and the black shines as if it were Bakelite. Another distinctive change is the removal of "Made in the U.S. of America" on the base. The reason is the new version was made in China, as a sticker inside the base says. The controller was also modified. On the log loader reissue, the circle-L logo looked bloated and clumsily reproduced. On the 97's controller, it looks normal. No bag of coal is provided. Now when can we expect the 165 Triple-action Magnetic Crane? 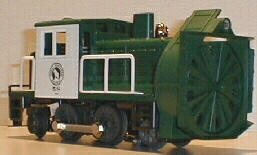 At the York meet in April '99, I saw an original boxed Postwar 58 Snowplow with an asking price of $1200. This was months after Lionel advertised their plans to reissue the same piece, for less than $200. Target delivery date was July '99. It was just released but since nothing from anybody is ever on time, we're used late deliveries. The reissue did not come as advertised. It was supposed to have a DC motor. It was delivered with an AC motor. That's good. The instructions indicate Magne-Traction, but there is none. That's no surprise, since none of the motorized units ever came with Magne-Traction. It has an electronic reverse unit, called the "104 E-unit." There is a small switch for it on the back of the cab. The cab is decorated accurately, with the familiar 58 number. The decorative bell is the same part used on the Century Club Berks and a light has been added to the front of the plow. The lens at the top of the plow on the previous models was never illuminated, so that was a nice improvement. Changing the light will prove to be a challenge for operators. The wires need to be snaked around the pulley system that drives the blades. The operating voltage for the snowplow is 12-18 volts A.C. As with the previous models, this one can only be expected to pull three or four cars. Upon running it we were amused to see the little bell swinging from the vibrations of operation. Also, in response to complaints about the permanently secured Postwar plate on the AEC switcher, Lionel packs the plate separately so you have the choice of putting it on or not. Now for main gripe: the rotary blades do not have the white swirl line. Big mistake. The swirl made it easier to see the blades turn and it created a fun optical illusion. Lionel seems to have a problem with lines. They didn't get lines on the Pennsy Torpedo and now they've left off one of the most charming features of this Postwar Classic. Aside from that, it's a nice piece. Made in the U.S of America.